Providing entertainment for your wedding here on Rhodes Greece. Our professional English D.J s are experienced in many forms of entertainment. You may wish to choose your style of music but you need an entertainer with a great sound & light system to make a great party. Great care & attention is given to your party to ensure you & your guests music requirements are catered for. We will of course ask you to supply the details of your first dance and any particular tunes you may wish to hear. Some couples have supplied us with a full playlist, which we are happy to use. 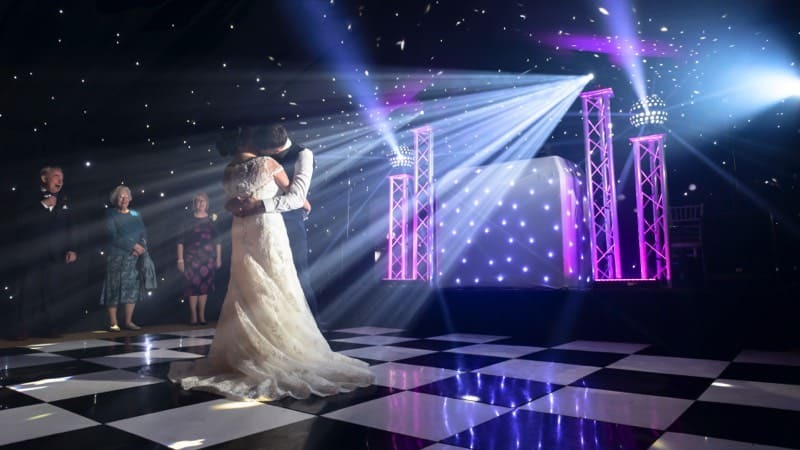 All of our discos are presented using the latest equipment to produce the highest quality sound and lighting for your reception party. We use lighting to create a party atmosphere. A sound system with a sub base which means the music can be clear and powerful without being overbearing. We use radio microphones, which you may use for your speeches & occasionally someone will wish to sing a song. To accompany our smartly presented professional Djs, our equipment is always dressed to match your reception and venue. Stands & cables are discreetly hidden away using back lit white covers to create a wash of mood lighting. Hire all the equipment you need, from a simple 2 speaker P.A System to a full on sound & light system with lasers, smoke & any effects you would like. All you have to do is plug in your ado device and play your favorite tunes for the evening. The systems will also be great if you have a family member who is a musician or a DJ. We can plug in drum kits, guitars, bass, keyboards & almost anything you could wish for. If you don’t want to bring your instruments with you. We can supply them too.